Emirates, Skytrax’s World’s Best Airline 2016, will launch a series of new cabin products and enhancements in 2017 for both its A380 and Boeing 777 fleet. The multi-million dollar cabin interiors upgrade programme includes an enhanced Onboard Lounge for its flagship Airbus A380 aircraft. The new Emirates A380 Onboard Lounge will make its first public appearance during ITB Berlin, one of the world’s largest tourism trade fairs. The new Emirates A380 Onboard Lounge will make its first public appearance a during ITB Berlin, one of the world’s largest tourism trade fairs. It is currently being installed onto one of Emirates’ brand new A380 aircraft at Airbus’ facilities, and will make its operational debut in July 2017. 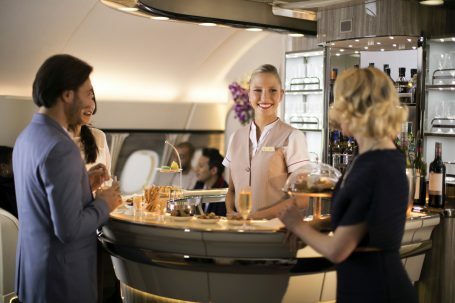 To find out more about the Emirates A380 experience, please click here.